URBANA, Ill. – Grape vines are a beautiful feature for your landscape that provide both aesthetic and edible benefits, says a University of Illinois Extension horticulture educator. Grapes can be grown in Illinois if you choose a variety that is hardy enough to survive the cold winter temperatures. According to the U.S. Department of Agriculture’s Hardiness Zone Map, Illinois has spans zones 5a through 6b. In addition to selecting for cold hardiness, select varieties for flavor, sugar content, use, maturity, and disease resistance. “This could be difficult if you are set on a certain cultivar taste, such as a French variety,” Black says. Two categories of grapes are cold hardy for Illinois: American and French-American varieties. American varieties (Concord, Catawba, Niagara, etc.) have the most cold hardiness and better disease resistance than French-American or French varieties. French-American varieties (Edelweiss, Frontenac, St. Croix, etc.) 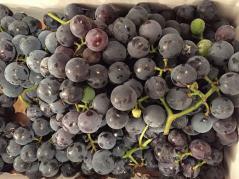 are French varieties of grapes on American rootstocks. American rootstocks allow for increased disease resistance and increased cold hardiness. Begin your preparations for the soil the year before by removing sod and cultivating the soil in a full-sun location. Test the soil to make sure that the pH is 5.5 to 6.5 with 2 to 3 percent organic matter. After soil preparation is complete, begin building your trellis. Many variations of trellises are available, and the type you choose can depend on your cultivar. Grapes need to be spaced 8 feet apart in the row and rows should be at least 10 feet apart. At planting, secure plants to the trellis wire and wrap them with chicken wire to prevent deer from eating the leaves. Pruning is key to well-developed grape clusters. Prune grape vines after the first year of growth, generally between February and early March, while it’s still cold but before buds swell. Sunlight exposure to the core of the grapevine helps to produce sugars and allows airflow to prevent disease. On average, pruning should remove 80 to 90 percent of the previous year’s growth. “This helps to eliminate dead or dying parts of the plant that could be a source of disease,” Black says. “Removal of this much of the plant can be alarming for some gardeners, but we are removing a lot of foliage annually to help provide a strong and lasting trunk for longer productivity through the years. “The first five years of establishment are critical for a long, productive life for your grapevines,” Black says. For more information on grape varieties and production, check out the University of Illinois Extension’s “Small Fruit Crops for The Backyard” at extension.illinois.edu/fruit/grapes.cfm?section=small or University of Minnesota Extension’s “How to Train Young Grape Vines” at https://www.extension.umn.edu/garden/fruit-vegetable/grape-training-young-vines/index.html.